Sometimes business success isn’t about changing the message, but rather changing the market. 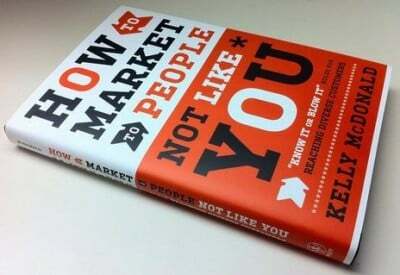 That’s the premise of the new book How to Market to People Not Like You: “Know It or Blow It” Rules for Reaching Diverse Customers (amazon link), written by my friend Kelly McDonald. Bursting with fascinating anecdotes, sound advice, and interesting facts about how different populations think, feel, shop and share this is a book that will benefit every marketer in some way. It’s an easy read – perfect for a plane – and Kelly’s style is approachable yet sharp. I found a lot of social media corollaries in this book, especially the sections about companies having to be operationally ready to address new markets. The discussion around corporate culture and its importance in market expansion was especially relevant. A key theme that is dead-on with social media is the notion that consumers want to do business where they feel welcomed and comfortable. Whether that’s hiring Spanish-speaking bank tellers or using content marketing to help customers understand what makes your company different and special, humanization and building kinship bridges is always a net positive. I interview Kelly about the book, her outstanding Hispanic agency (McDonald Marketing in Dallas) and the big takeaways inHow to Market to People Not Like You . Pick up a copy, I think you’ll enjoy the read.